Last month in a debate in the House of Lords on the legacy of the Troubles and the role of the security services I said that the most depressing aspect of the subject under discussion is that we had to have the debate at all. After the shameful investigations into allegations of misconduct by the military in Iraq and Afghanistan, one might have thought that the appetite for further investigations into the conduct of members of the armed forces in other conflicts might have diminished. Not so. Despite the Iraq Historical Allegations Team looking at over 3,500 allegations, the only case that has come to court has been that of a bent investigator. Yet attention has returned this time to Northern Ireland. Field Marshal the Lord Bramall said in the Lords that the 2010 Saville Report into Bloody Sunday should have been the end of Bloody Sunday. But now there is a horrible suspicion among veterans that the non self-incriminatory basis on which they gave evidence to Saville has been breached, and that some soldiers do indeed now stand liable for further investigation and in fear of a knock on the door. But that knock on the door is not confined to elderly retired paratroopers, riflemen and cavalrymen. On my last day as Chief of the General Staff on August 28 2009, the final scheduled appointment in my diary, before I left the Ministry of Defence for the last time in uniform, was with two investigators from the Police Service of Northern Ireland’s Historical Enquiries Team. They had travelled from the Province to London to quiz me about the killing of a young man in Belfast some 36 years before. Having explained the circumstances of the day in question, I assumed that the matter was closed. Not so, as one of my corporals – now 76 years old — was subsequently questioned, the police finally accepting that events in our statements, nearly 40 years before, were an accurate account of a hostile attack which had been responded to professionally within the terms of the Yellow Card and within the law. There are other similar high profile troubling cases. While the Army kept extremely good operational records, the terrorists did not. This makes a very uneven playing field on which to conduct these retrospective investigations. All allegations were investigated by service and civil police at the time and statements taken. Why is re-visiting whatever evidence may still exist 40 years later likely to bring any greater clarity? Of the 2,547 cases referred to the PSNI Legacy Investigation Branch, 2,265 are deemed to be terrorist cases and only 282 to be British Army/Royal Ulster Constabulary cases — that is 10%. But the reality is that the 90% of cases which were killings by nationalist and loyalist terrorists were murder by any description of the word, while the 10% attributable to the security forces were deaths brought about by troops and policemen, in the vast majority of cases, doing their lawful duty. There is a strong suspicion that the low-hanging fruit of security forces cases are being plucked first, and, on past evidence, are likely to be so by the proposed Historical Investigations Unit (HIU). While over 500 prisoners convicted of terrorist offences were released on licence as part of the Belfast Agreement, another 365 Royal Pardons were handed down over the last 35 years and over 300 ‘On the Run’ letters were issued, in the same period of time just four servicemen who served in the Province were convicted for murder while another ten were prosecuted and acquitted. Does this not speak volumes about the integrity of the Army? In the preamble to the legacy consultation, the Northern Ireland Secretary Karen Bradley has said that the legacy proposals should be “balanced, fair, equitable and crucially, proportionate”. Historic and current activity is demonstrably not “balanced, fair, equitable and crucially, proportionate”. From a military veterans’ point of view this consultation is already flawed in that it has precluded at the outset the introduction of a statute of limitations, ending these historic investigations. However, I am aware that in pursuit of the objective to be “equitable” there is a concern that a statute of limitations to protect former members of the security forces would mean that terrorists would, in effect, be given an amnesty also. So the Army is caught in the cross-fire between the Sinn Fein nationalist agenda to re-write history and paint the IRA as having fought some form of Just War against their self-styled oppressive state, and the Democratic Unionist Party and Ulster Unionist Party’s insistence on bringing predominantly nationalist terrorists to justice. The proposed HIU is only going to examine fatalities, ignoring the 40,000 people, including 6,000 soldiers, who were injured during The Troubles or investigating who was responsible for over 15,000 explosions in the Province during that time? Is this ‘equitable’? The British Army is a national institution which should be regulated under the authority of the Westminster Parliament, not allowed to become victim to the intrigues of Stormont, whenever that assembly might re-convene. The welfare and duty of care towards servicemen and military veterans should clearly be championed by the secretary of state for Defence and not left to the outcome of a consultation by the NI Secretary. Incidents in which members of the security forces fired their weapons were fully investigated by the military, and where appropriate, the civil police at the time. In the vast majority of cases a decision was made that lethal force had been used within the prevailing rules of engagement and no further action was necessary. Those investigations should be confirmed as legal, binding and final. If the principle of double-jeopardy is accepted then it would be quite appropriate for there to be a statue of limitations applying to those cases and individuals who have already been investigated. This would protect policemen and soldiers who were doing their duty in pursuit of the sovereignty of the Crown’s right to rule over the whole of the United Kingdom and Northern Ireland, but crucially, it would leave exposed to the full rigours of the law those terrorists who have never been exposed to investigation. That I submit is “balanced, fair, equitable and crucially, proportionate”. To many soldiers fighting in the Province during the 1970s and 1980s it felt like a war zone, although the IRA insurgency was never branded as such. In 1972 alone, 102 British soldiers lost their lives fighting there. The peace process since the Good Friday Agreement has brought better times but the continuation of that peace must not be at the expense of more soldiers’ lives ruined. Soldiers fully understand von Clausewitz’ dictum that: “War is but a continuation of politics by other means”. But to paraphrase Clausewitz, perhaps Ms Bradley in the NIO might reflect on the reverse: “A peace process should not be a continuation of war by other means”? 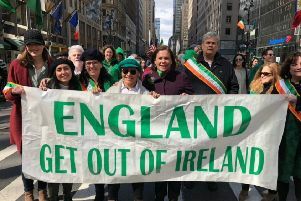 The nationalist agenda to divorce Northern Ireland from the United Kingdom is as alive today as it was throughout the 38 years of The Troubles. The British government must not be sleep-walk into that agenda.